I am grateful for the protection afforded us by the armor of God, that You Lord, are our defense. The more non-obvious part of the process comprises making and using a jig to guide the router, so that is what I will concentrate on here. The mortising jig has the simple function of guiding the router so that you can end up with mortises in the center of the edge of the 1×2 bed posts. Centering is critical, so that the cross members align with the upright ones. In the picture above, you can see the workpiece clamped in between two scrap lengths of 2×8 lumber that I had laying around. On top of those are other scrap pieces carefully aligned and screwed down to limit the travel of the router. There is no vertical movement, and only enough freedom for horizontal movement to get the correct width of the mortise. The upper and side limits are only attached to the top 2×8, so that when the clamps are loosened, the work piece can be moved or a new one inserted. In the second photo, you can see the router in position in the jig, and the limited freedom to move sideways. It always takes me some trial and error on some scrap pieces to get the jig-fine tuned to give a good result. This third photo shows the finished mortise. Using a 3/8″ router bit gives the right proportion for 3/4″ stock. Note the alignment marks on the jig. These are needed to get the vertical spacing right on each post when clamping the workpiece. Many passes are made with the router, each slightly increasing the depth. As long as the jig is a snug fit, this process will give a nice mortise with a snug fit and avoid overheating the router bit. The cross pieces have a tenon cut to fit into the mortises on the bed posts. I did this cross-cut work with a dado blade in my table saw. (A dado blade set consists of two saw blades separated by a group of “chippers” that remove the material between the two blades.) I used the full 3/4″ width of my blade to minimize the number of passes. The material removed is controlled by the height of the blade, set to exactly 3/16″, leaving a 3/8″ thick tenon. Passing through the saw has to be done carefully to get all four cuts to align exactly. I clamp a block to my guide fence to serve as a starting guide for the length of the tenon. This is much safer than allowing the end of the tenon to drag along the fence while going through the blade. A little sanding is all that is required to get the square tenon to fit in the round mortise made by the router bit. I took the picture above to demonstrate the fit while the bed post was still in the mortising jig. I will post the remainder next time. Lord, thank you for filling Your Word with so many magnificent promises! May they be constantly in my thoughts and more and more on my lips. 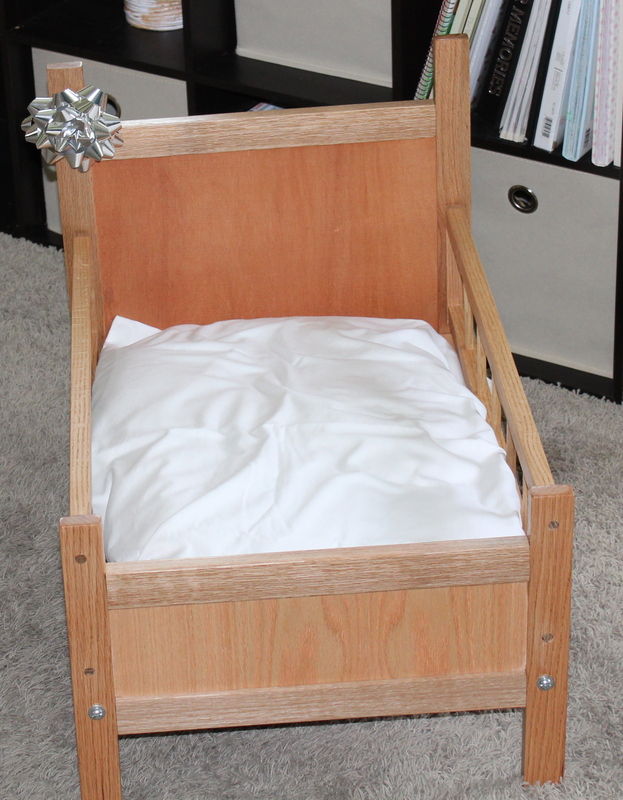 I had thought about possibly showing the process of building this oak doll bed for my granddaughter, if there is any interest. The project was inspired by the demise of her old one when her younger brother decided it would be fun to get in. I’m sure it probably seemed like a good idea at the time.